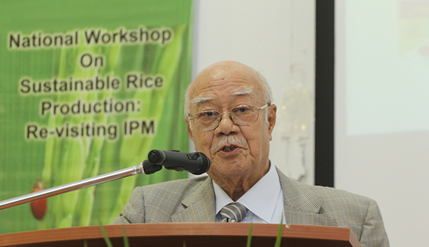 BANGI, 18 Sept 2012 – Problem and implications of low rice production growth that is not able to match the higher growth rate of the population of the world are the subject of a workshop on ‘Sustainable Rice Production’ here last week. The workshop organised by the Faculty of Science and Technology (FST) of The National University of Malaysia (UKM) deliberated on solutions to overcome the escalating problem which include the growing of high yielding and quality rice while ensuring safety of the rice farmers. Tan Sri Dr Mohd Noor Ismail, Corporate Advisor to Tradewinds Malaysia Berhad in his key note address at the workshop said the rice business has to be looked at wholistically from farm to shelf. He said finding ways to grow rice better and faster is all well and fine but attention must also be given to the issues that goes beyond research so that whatever findings and innovations made will not be undermined. He has visited various rice fields, spoken to farmers and found that the problem of suppply channel posed a bigger problem to them than working the land under the hot sun. The problem ranges from the supply of certified seeds which are more resilient to pests by the Ministry of Agriculture and Agro-Based Industry, insufficeint water supply when needed and lack of harvesting equipment. These, he said, are pertinent issues to rice farmers who only have 105 to 110 days from planting to harvesting. Delays in receiving certified seeds have forced farmers to use non certified seeds which have lower yields. The flow of rice from the fields to the mills also lack quality control. For example there had been cases of wholesalers sending high quality grains to competing mills rather than the mills identified. There is also unnecessary wastage, he said. Sometimes grading of the rice at the mills were compromised where different grades of rice are mixed but distributed and sold as high quality grade. Tan Sri Mohd Noor said all such factors impacted rice production resulting in losses to the farmers. All the problems arise because rice is a commodity and traded for profit. He recounted events in 2008 when the price of rice sky rocketed and affected more than 100 million of the worlds population especially those who live below the poverty level. Fear and panic compounded the problem yet the rise in prices was due to inflation and not because of real supply shortages. The situation was made worse when the rice exporting countries fearing they may face shortages restricted their exports at a time when the importing countries were importing more in a bid to stabilise prices they faced. China imposed a 5% tax to its rice exports, Vietnam stopped new rice export contracts while Egypt banned rice shipments, he said. Chairman of the organising committee, Associate Prof Dr Norela Sulaiman, representatives from Food and Agricultural Organisation (FAO), Ministry of Agriculture and Agro-Based Industry took part in the workshop.